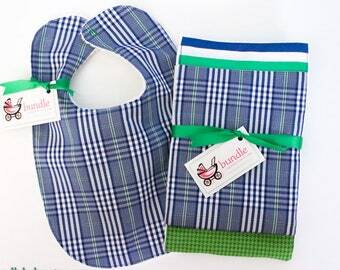 Bibs and burp cloths that are classic and stylish baby gifts. 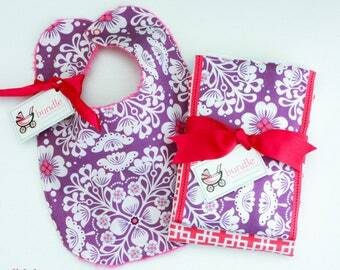 Bundle Burpcloths and Bibs make great gifts! 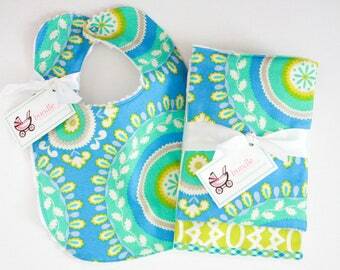 They are perfect to give the mommy-to-be at a shower or as a hospital gift. 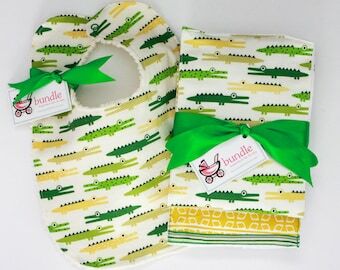 If you can't give a Bundle Burpcloth Set or Bib in person, let me gift wrap it and mail it for you! Have a look around my shop...I'm sure you will find something perfect for the little bundle in your life. Please see my Shop Policies section for all of my policy information. I now offer FREE shipping on all orders for standard First Class shipping! Buy as many sets as you like, standard shipping on everything is now completely free! The personalized bibs for Alexander turned out awesome!! Thank you for your time and patience in the design phase and thank you for shipping them to me on time for the party. This is the second time I’ve ordered this item from you and I will certainly be ordering in the future. 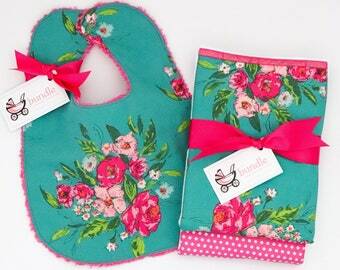 Gorgeous bib and burp cloth set!! Very well made and of the highest quality. Will definitely shop here again. Happy shopper!! Very cute and nicely made. Seller easy to deal with and responds quickly. Seller even caught a mistake that I made when I was ordering. 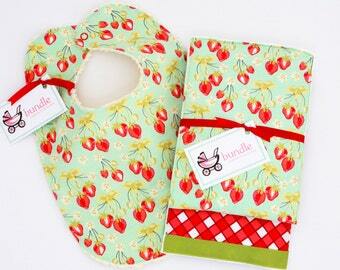 Bundle Burpcloths and Bibs make great gifts! They are perfect to give the mommy-to-be at a shower or as a hospital gift. 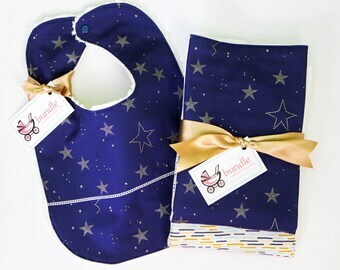 If you can't give a Bundle Burpcloth set or Bib in person, let me gift wrap it and mail it for you! I am glad to be able to offer you a product that I believe in and really enjoy creating. My burpcloths are made using the highest quality, most absorbent 6-ply OSOCozy cloth diapers and beautiful high quality fabrics. 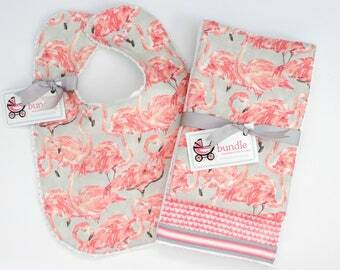 My bibs are created super absorbent using the same wonderful fabrics and backed with soft cotton chenille. I love working with the different fabrics and trims. It is heaven...thank you for supporting me in something that I love so much! A little about me...I am a 41 year old stay at home mom of a beautiful 12 year old little girl and a 5 year old little boy. I love all things crafty, especially sewing. I started sewing when I was very young (12!) and it is a fantastic outlet for me. I mostly sew during my kid's school hours and at night. I love playing with my children, gardening, sewing, scrapbooking (digital and traditional), and cooking/baking. Needless to say, I am never bored! Welcome to my little shop! I am proud to be able to offer you a product that I believe in and really enjoy creating. 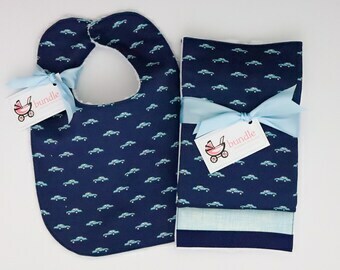 My burpcloths are made using the highest quality, most absorbent 6-ply Gerber cloth diapers and beautiful high quality fabrics and my bibs are created super absorbent using the same wonderful fabrics. I love working with the different fabrics and trims. It is heaven...thank you for supporting me in something that I love so much! I ship within 7 business days from completed payment. I ship all Bundle Sets USPS First Class Mail. Please note: I, the seller, am not responsible for a damaged or lost package once it has been shipped to a buyer. If you wish to guarantee a refund or replacement, should your package be lost or damaged, you may purchase insurance for an additional $2.00. Please let me know at the time of purchase and I will send you a separate invoice. Please note also that I ship directly to the address that comes through with the order. Thank you to everyone who has been buying directly from me locally! If you live near me (in the Charlotte area) I will be glad to deliver your item to you for free, no shipping charges. Please Convo me to let me know that this is what you would like to do and I will adjust your invoice. Once you buy through Etsy then you can use Paypal or pay me with a check when I deliver your item. Feel free to Convo me with any questions. 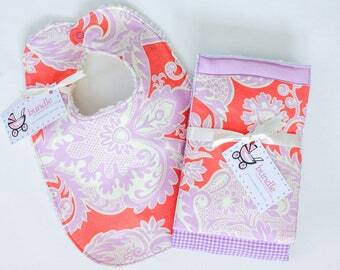 I am so happy to be providing all your beautiful babies with stylish burpcloths and bibs!